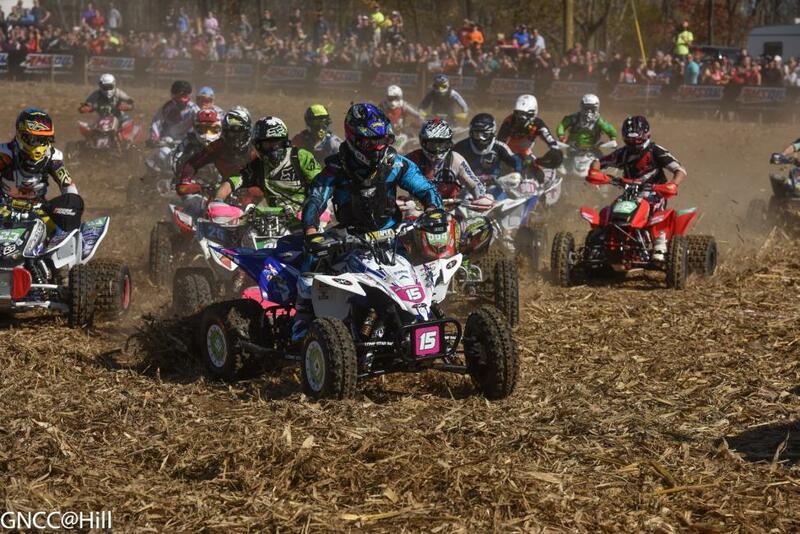 It has been approximately two decades since the XC1 Pro ATV Championship has been decided at the final round of the AMSOIL Grand National Cross Country Series, and perhaps even longer since its top contenders came into a finale with a tie in points. 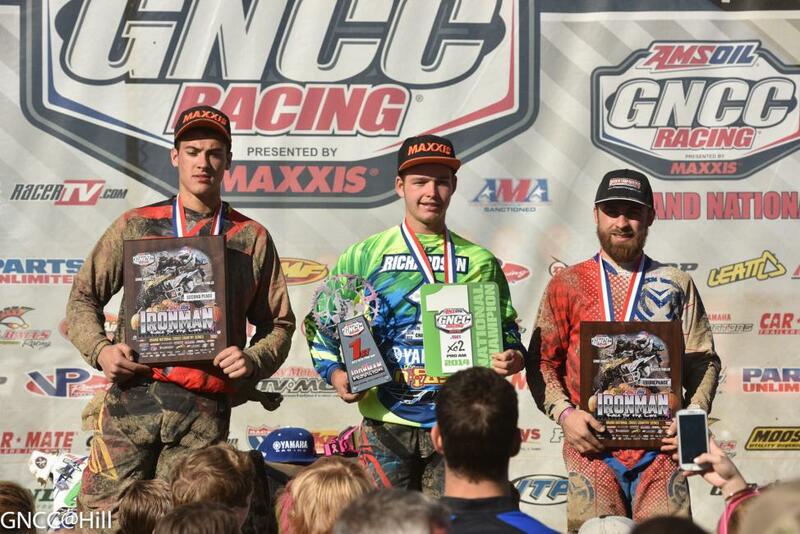 But Saturday's AMSOIL Ironman GNCC was a winner-take-all affair in both the XC1 and XC2 Pro Am classes as four elite riders looked to secure two major championships at the 20th running of the Ironman GNCC in Crawfordsville, Indiana. As if the pre-race hype surrounding the championship chase wasn't enough, XC1 front-runners Walker Fowler and Chris Borich treated thousands of Indiana cross-country fans to one of the most exciting finales in the history of the AMSOIL Grand National Cross Country Series, presented by Maxxis and sanctioned by AMA. In an all-out drag race to the finish, Team Maxxis' Chris Borich emerged victorious over N-Fab AmPro Yamaha/Lonestar/Maxxis/MXP's Walker Fowler, while Fowler's Yamaha-backed teammate Cole Richardson came away with his first career XC2 Pro Am title after a hard-fought battle with SICC Racing/Maxxis-backed Marshal Goings. As the green flag dropped for the highly anticipated finale, Fowler wasted no time in making his way to the front, and despite a bad jump off the start, Borich quickly jumped into second close behind. Fowler commanded the lead for a majority of the two-hour race, while Borich took a more veteran approach in applying pressure from behind. However, in true Borich fashion, the champ kicked it up a notch on the final lap and the duo swapped lead positions several times as they encountered everything from lapped traffic to deep mud and even the occasional tree. Fowler led the way into the final sections of the Ironman motocross track, but Borich positioned himself to make a last-minute pass for the lead. The two riders flew side-by-side over the final motocross jump and with only a couple corners left to go, Borich inched his way into the lead where he held Fowler off until the finish. "I kind of thought it was over for a minute but I just put my head down and kept pushing," Borich said. "I doubled up the triple and I thought I threw it away on the outside line but we came together at the bottom and it was a drag race to the next corner. I knew since I was little bit ahead of him that I'd be able to take it into the finish." Fowler came through the finish only two tenths of a second behind Borich, despite a valiant charge in the final moments of the two-hour battle. "I knew that last lap was going to be cut throat, he's a six-time champ now for a reason," Fowler said. "The amount of times we were rubbing and bouncing off each other was insane but it wasn't anything out of control. It was controlled chaos and it was just so cool." Borich admits that the weeks leading up to the finale weren't easy, especially following a six-round winless streak, but the six-time champion maintained his focus through the final round. "There was three long weeks where we were just sitting there tied for points and couldn't do anything about it. I was on the bike pretty much every day for an hour and that's when I started having fun," he added. "I have to thank my friends for pushing me during that time." With a total of six wins for the season, Fowler ultimately came within five points of the 2014 National Championship, which is a feat that hasn't been done during Borich's previous five-year championship reign. Fowler added, "I'm only 21 years old, so I think that says something about where we're at after this season. I am bummed but man was that cool! It was so fun and I just can't thank Chris enough for letting me be up there and racing me clean the whole time." RacingPowersports.com/CST Tires/PirateMX.com's Adam McGill put in a solid ride to finish third overall for the day, giving the West Virginia native third place in the championship standings. The XC2 Pro Am Championship stage was set just as exciting as rookies Cole Richardson and Marshal Goings also entered the season finale with a tie in championship points. 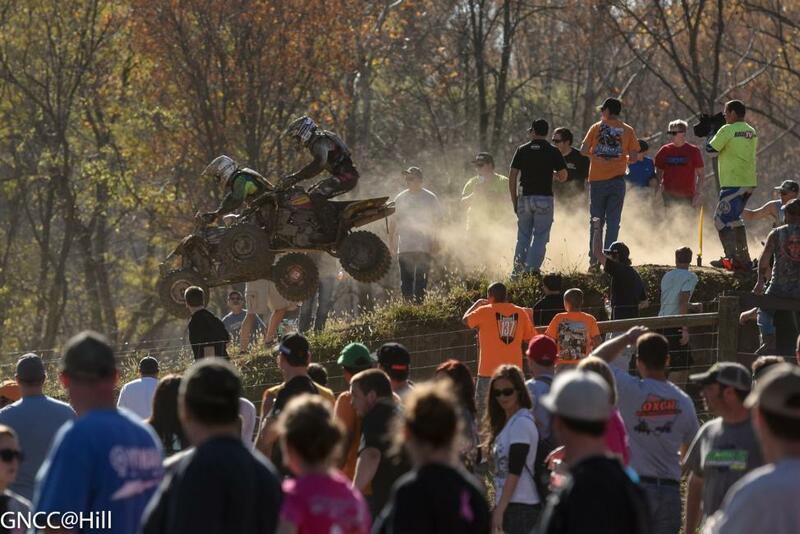 While Richardson grabbed the official holeshot, Indiana's Goings held the early advantage. The duo battled it out during the first half of the four-lap race but it was Richardson who prevailed in the end to capture his first career Pro Am championship with a big victory at the final round. N-Fab AmPro Yamaha/Lonestar/Maxxis/MXP's Richardson rounded out the season with eight victories behind him, while SICC Racing/Maxxis' Goings put forth a solid performance with five wins to finish only five points away from the championship position. "Winning the championship has always been my dream and I couldn't be happier right now," Richardson said. 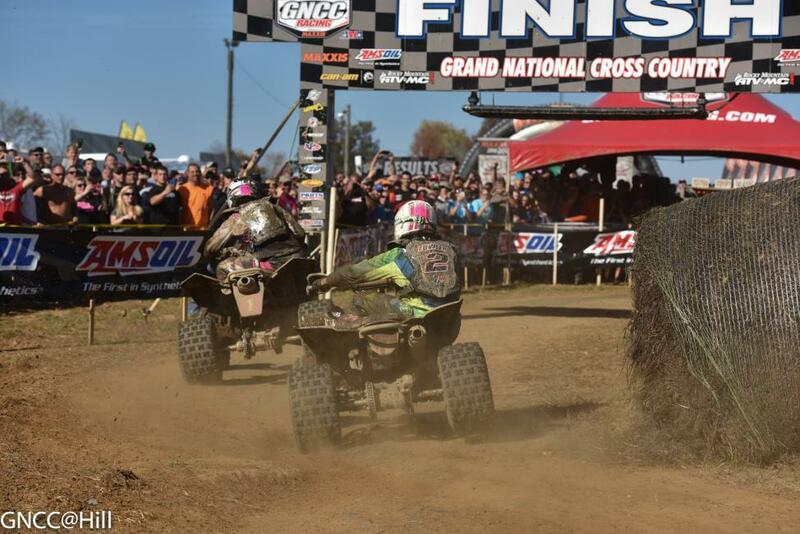 In Side-by-Side racing action, the Can-Am/Chaney Racing Team earned the 2014 XC1 Modified National Championship at the sixth and final round in Indiana. 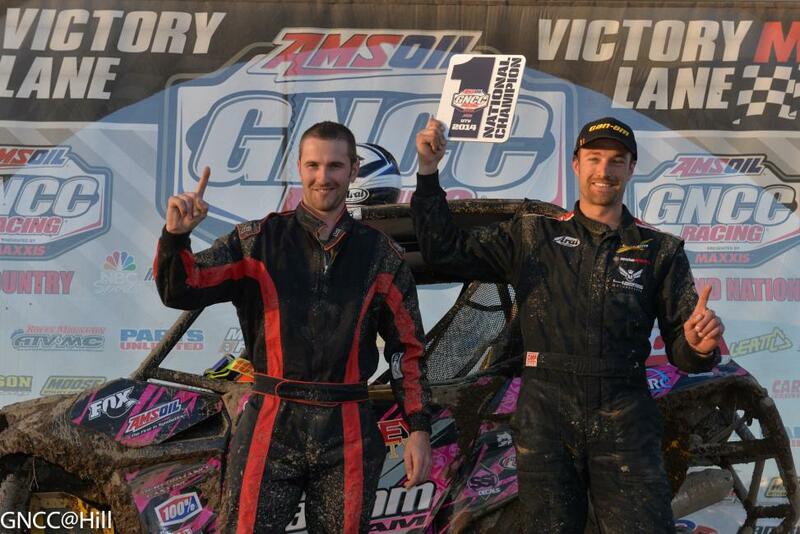 It was a big day for Can-Am as the team, led by Kyle Chaney and his co-pilot Chris Bithell, led the brand to its first-ever XC1 Side-by-Side championship. 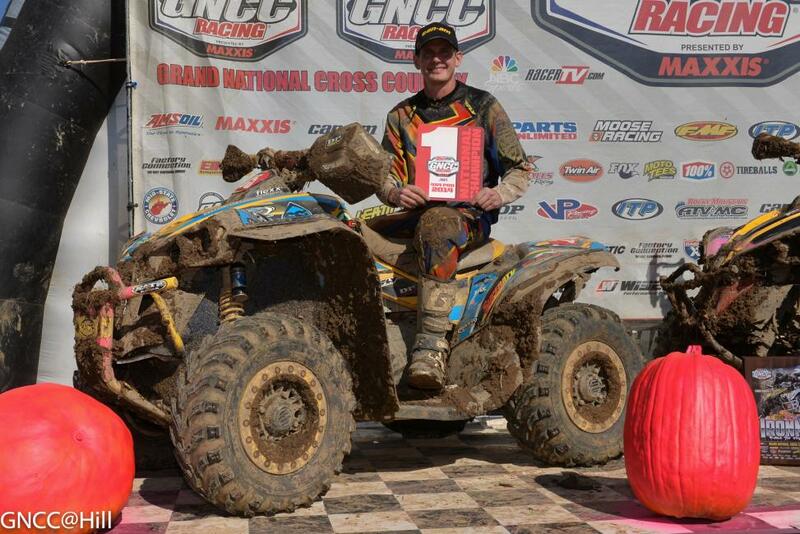 In the 10 a.m. race, ATV Parts Plus/Can-Am's Bryan Buckhannon capped off a successful year in the inaugural 4x4 Pro class by taking home the 2014 National Championship with a solid second place finish at the final round. If you missed any of the racing action from Saturday's AMSOIL Ironman GNCC, you can catch it all right now on www.racertv.com or by clicking HERE. For more information on the series, visit www.gnccracing.com.